How Do I Choose the Best Crenshaw Melon? Cut crenshaw melon filled with strawberries. 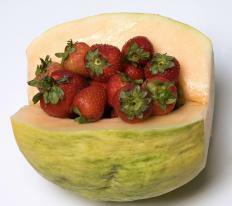 A crenshaw melon is a melon variety that is a hybrid between a casaba melon and a Persian melon. These types of melons should be picked and eaten when they ripen, usually during the summer months. Ripe crenshaw melons usually have somewhat waxy-feeling yellow skin, and they are also usually heavy. You should not choose a melon that is soft, or on that has any mushy or dark spots on it. Crenshaw melons typically grow best in warm climates, although they can be grown in some temperate climates as well. They are shaped somewhat like a tear, with flat bottoms and pointed tops. The pointed end of the melon is where it was connected to the main vine. Like other melons, crenshaw melons will not ripen once they have been picked. When choosing the best crenshaw melon, you want to make sure that you choose one that is ripe. These melons generally have a light yellow skin once they have ripened, and they may sometimes have a greenish tint. You should avoid very green crenshaw melons, however, since this is a sign that they have not fully ripened. The skin of a crenshaw melon will feel somewhat waxy when it is ripe, and most of the melon will feel firm. The area around the pointed end of a crenshaw melon, however, will usually be somewhat softer than the rest of the melon. Most individuals also tap on the side of a melon before they pick it. A hollow thumping noise is also indicative of a ripe melon. You should also pick up each crenshaw melon that you are considering. The juiciest melons will usually be the heaviest ones. This is because the juicier melons tend to contain a higher percentage of water, which makes them heavier. There are also a few things you should avoid when trying to choose the best crenshaw melon. For instance, these melons should not have any soft or mushy spots on them. You should also avoid any melons with brown spots or mold. A crenshaw melon is typically very sweet, but some say that it also has a spicy taste. It is usually best when it is eaten fresh. These melons can be peeled and chopped before being eaten plain, or they can be added to fruit platters or salads. Any crenshaw melon that is not eaten when it is harvested should be stored in the refrigerator, where it will last for up to a week. How Do I Choose the Best Casaba Melon? What is an Ogen Melon? What is a Crenshaw Melon? What is a Casaba Melon? What is a Melon Baller?